There are many different types of trampolines available, so many, that making a decision can actually pose a difficult choice. The first thing you should do is identify what the trampolines intended purpose is before making a decision on the brand and type of trampoline you want to purchase. Once you have a good idea of what you want to do with the trampoline you can go over the rest of the options to find the perfect trampoline for you! What shape trampoline should I get? These are the classic trampolines that everyone has grown to love over the years. Many of us grew up jumping on trampolines and the standard models are all that was around back in the day. They are traditionally round but can be other shapes as well. Commonly constructed with steel legs and padding around the metal springs for safety. Some key features of kid’s trampolines are they are smaller and pose less of a risk in getting injured. Many of these trampolines will feature extra padding, netting and additional safety features to ensure the safety of the kids playing on them. If you have some little ones that you want to start their journey bouncing around, check out the kid’s trampolines section. Rebounder trampolines are most commonly used for fitness exercises and workouts. They do not bounce all that much and traditionally have a fairly small footprint. 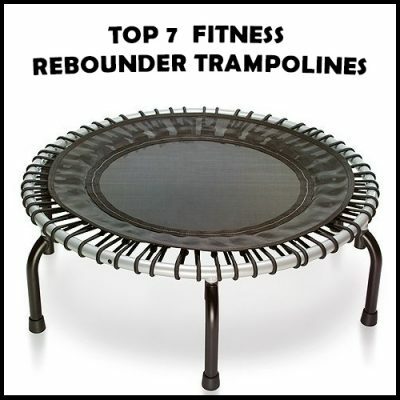 If you are in need of a trampoline to compliment your intense workouts get a rebounder. Sometimes referred to as water trampolines are unique creations. These trampolines float on top of water and are usually anchored by straps. They provide hours of fun in the water weather you have it in a large inground pool or anchored on a lake. Make note that some of these trampolines are very large and can cost a substantial amount of money depending on the size of the water tramp. The possibilities are endless with water trampolines. What is the Best Shape Trampoline? These are the most common and will have the most bounce in the center of the jumping surface. They are considered to be the safest shape as the springs orientation will keep the jumper toward the center of the jumping area. Round trampolines will not offer as much bounce as a rectangular trampoline but for most common fun the traditional round trampoline will keep everyone happy. Have you ever seen the Olympic trampoline competitions? They use these rectangular trampolines because of the superior bouncing capabilities. Most of these trampolines are very large and will cost more than a round trampoline counterpart. If you are looking to get some major air to perfect your acrobatic or gymnastics moves the rectangular trampolines will get the job done. Oval trampolines are a hybrid between a round and a rectangular type trampoline. These offer a large surface area to accommodate families or larger groups of people. The large area combined with great jumping power is a recipe for tons of family fun. If you cannot decide whether you want a round or a rectangle settle for both with the oval type trampoline. Octagon and polygon trampolines are nowhere near as common as round or rectangular trampolines. There really is not much of an advantage having an octagon trampoline other than they look really cool. If you love the aesthetics of the octagonal trampolines be prepared to pay a bit more as these trampolines are less common and carry a higher price tag. If you want to jump as high as possible on a trampoline a gym tramp will send you sky high. Most of these trampolines have a large rectangular surface with exceptional bouncing capabilities. You have probably seen one of these at a kid’s birthday party or local festival. Quality bouncy castles are manufactured with woven oxford cloth or PVC tarpaulin. The material is filled with air to create an air-cushion that you can jump on. These are great for little kids as there are no metal springs or poles they can hit their heads on. Just as you would think these trampolines do not use springs. Instead they use flexible composite rods, which sit underneath the trampoline surface and out of harm's way. These spring free trampolines offer tons of safety features and are gaining popularity in the trampoline community of the past years. 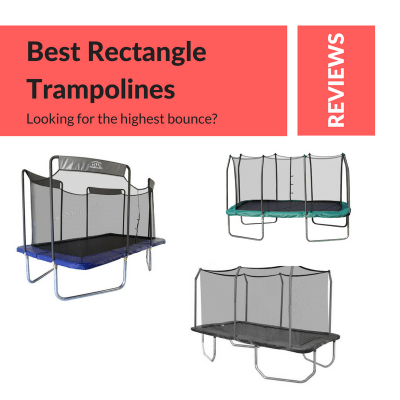 As these products are newer to the game and offer amazing safety features they tend to be a bit more costly than traditional trampolines. So now you have a good idea of what type of trampoline you will need there are a ton of other considerations that you must explore. Making sure you cover all of these components is the key to having years of safe fun with your new trampoline. This could be one of the most important and underestimated features people ignore when purchasing a trampoline. In many cases bigger is better, but if you have a limited area where you will be setting up the trampoline this can be a deal breaker. Make sure to measure the area where the trampoline will live and ensure there is ample space on all sides to avoid hitting objects if someone bounces out of the trampoline safe area. Trampolines come in many shapes and depending on what you are trying to get out of the trampoline will drive the decision in this area. Trampolines all have a weight limit that you should abide by to ensure jumpers safety and the longevity of your trampoline. A few tips for gauging the trampolines required weight limit are making sure you have a good idea of how many people will be using the trampoline and how much they weigh. Younger kids weigh less but they grow quickly so if you have 3 little kids lets say 5-8 years old and you want the trampoline to last for 5+ years you will have to take into consideration the kids growth over the years to come. If you have a neighborhood full of kids coming over to join in on the trampoline fun you will need to restrict the number of jumpers at any given time to avoid going over the weight limits. Springs are one of the most crucial components to a trampoline's functionality. Making sure they are made of quality metal and have rust protection will keep them operating for years to come. If you are looking to replace springs for your trampoline make sure the length of the springs and connectors on the ends are the same as the originals to allow for easy installation. The padding is another feature to consider doing some research on. Having ample padding around the trampoline will provide a needed safety buffer between jumpers and the springs. In addition to the safety benefits it also acts as a cover for the springs protecting them from the elements. Trampolines offer endless amounts of fun if used properly. Look for additional safety features when purchasing a trampoline. Some trampolines will feature additional safety nets and pads, make sure you have enough of these features before making an investment in a trampoline. Make sure the frame is made of quality material and is suitable for the environment you live in. Most frames are made of steel and will provide protection against rust and other environmental wear and tear. Some frames have "L" shaped legs to keep the trampoline from tipping over, depending on where the trampoline will be placed this may be a needed feature to prevent the trampoline from tumbling over. Pricing is pretty self explanatory but we will touch on it briefly. Traditional trampolines will usually fall in the $250-$500 price range while some of the specialty trampolines or springless ones will cost a significant amount more. Make sure you know your budget before getting your sights set on a trampoline that is out of your price range. Depending on your experience putting a trampoline together properly may not be the simplest of tasks. Most trampolines will come with a spring puller tool to attach the springs to the frame and jumping mat but some models do not include this and will need to be purchased separately. Make sure to read the entire manual and watch any setup videos before attempting to put the trampoline together. Covering the trampoline when it is not being used is key to keeping the trampoline in good working order for many years to come. This will protect the trampoline from rain and sun damage which will destroy the trampoline over time if not covered. If you are going to make the investment in a trampoline we highly recommend getting a cover for storage purposes. Always avoid standing and jumping on the edges of the trampoline. This will not only make the experience safer it will keep the springs from getting ruined and put less stress on the padding. A simple rule to enforce will greatly increase the lifespan of the trampoline jumping surface. Shoes will scuff and dirty up the trampoline much faster than socks or bare feet. Try to keep the shoes off the trampoline if possible. This may seem like a no brainer but lots of people cannot pass up a good deal. Make sure to buy from a trusted brand, you do not want the safety of your children to be compromised by the $100 on sale trampoline that is manufactured from cheap materials. Make sure you buy from a trusted brand to ensure the quality and safety features are up to your standards. I don’t know about you but I would rather spend an extra few dollars to get something that is known to be safe and is manufactured with my kids in mind. We have listed our favorite trampoline manufacturers with a little info on what each brand brings to the table. If you have a recommendation for a brand that is not listed please let us know so we can update our information. One of the most well know names in the trampoline business is Skywalker Trampolines. They were founded back in 2004 with the primary goal of providing safe family fun that keeps kids active and engaged. With over a decade of experience Skywalker has a large variety of shapes and sizes available that will anyone’s needs. Skywalker features innovative safety and design elements that make their products some of the highest quality and safest products on the market. If you are at a loss for what brand to go with Skywalker is one of our most trusted trampoline manufactures we recommend. 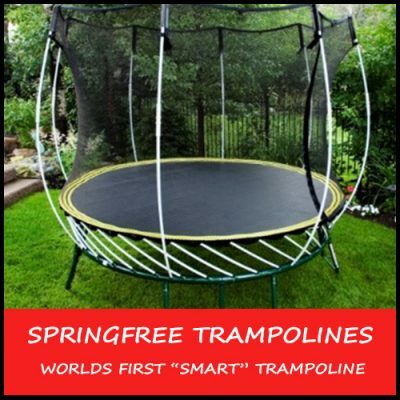 The SpringFree company completely re-invented the trampoline with their spring-less trampolines. With over 15 years of research and development Dr. Keith Alexander has created one of the safest trampolines the world has ever seen. The company originated in New Zealand but over the course of a few short years expanded their business to the rest of the globe. They won product of the year in 2010 and continue to create newer and safer trampolines for the world to enjoy. If you have a little extra money and are focused on the safety aspects SpringFree is the right choice for you. A famous manufacture of children’s toys that was founded in 1969 is Little Tikes. With years of experience they have created some of the most well-known toys in history. 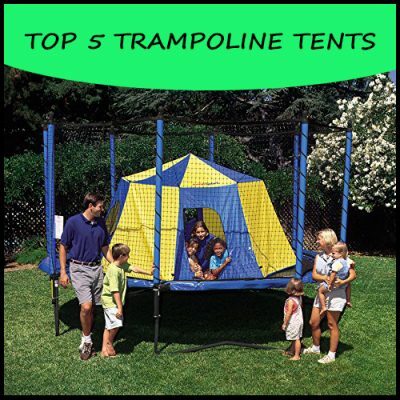 They make a few trampoline and inflatable bouncer type products for kids that are both playful and safe. If you are looking for a “toy” trampoline for your young ones the Little Tikes product line will best suit your needs. ACON Trampolines is based out of Finland and was established in 1996. The company focuses on promoting an active lifestyle with their trampolines. ACON is a manufacturing company that has over 500 products that promote this active lifestyle. In 2014 ACON opened a USA division to allow for easy distribution to USA and Canada. One of the leading manufactures in safe trampolines today. Family owned and operated JumpSport was founded in 1995 when Mark and Valerie Publicover had a child from their neighborhood get injured on a trampoline in their back yard. This event lead to Mark coming up with innovative ways to make trampolines safer for kids and adults to jump on. Over the years the Publicover’s have released multiple innovated safety enhanced trampolines and safety accessories. JumpSport has been featured on the news and on fitness TV shows like The Biggest Loser and The Doctors.